The Barrington F&R, EMS Division proudly serves an estimated 8,400 people living in an area of 50 square miles. We operate out of one Station that serves a primarily rural area. Our Division is part of the Fire & Rescue Department whose members serve on a volunteer basis. The EMS Division works from a pager/cell phone alert system and is dispatched through UNH Dispatch in Durham. 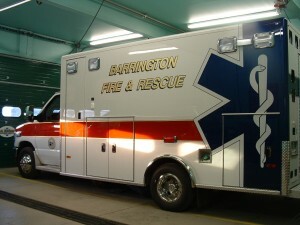 We work hand in hand with the Barrington Fire Division and Police Department. When there are not enough EMS Responders to fully staff the Town ambulance for a Call, a Mutual Aid/Intercept system with the surrounding communities is activated. In 2012 we had 462 EMS Calls and 511 Patients. We had to rely on Mutual Aid Services to transport only about 4.2% of our Patients, but we had at least one Licensed EMS Provider at more than 99% of all our Calls. We were even able to supply Mutual Aid to our neighbors. Our average response time from Page to first Patient contact was 11.8 minutes. Division members are recommended by the EMS Chief and approved by the Fire Chief through the Probationary Member process and must maintain current certifications. Funds are available for a Response based stipend/point system, training and equipment reimbursement. New applicants are always welcome; if you are interested, submit a volunteer application to AJM11013@aol.com, or just E-mail us any questions.